Roland today introduced a new portable digital audio recorder, the R-26 Portable Recorder. The R-26 offers six simultaneous channels of pro-quality audio recording to SD/SDHC media. With two types of built-in stereo mics, XLR/TRS combo inputs and USB audio interface function, the compact R-26 is designed for applications such as solo and ensemble music recording, environmental sound capture, broadcasting, and audio/video production. Two stereo mic types—omnidirectional and XY—are integrated into the R-26’s chassis. In addition, there are two XLR/TRS combo inputs with phantom power for connecting external mics or line-level devices, plus a stereo mini-jack for a plug-in powered mic. The R-26’s large touch screen provides detailed level metering and convenient fingertip control over many functions, and is equipped with a backlight for visibility in any situation. Hardware controls are ergonomically organized and clearly labelled, with large input level knobs for precise adjustments, and dedicated buttons for often-used functions. The R-26 also features AUTO-SENS for setting input levels automatically, as well as onboard waveform editing. USB 2.0 audio interface – allows for both data transfer and audio interface capability with Windows and Mac-based computers. Users can connect the R-26 and use its built-in mics and external inputs as a high-quality input device for their favourite audio recording software. Loop-back recording is also supported, allowing multimedia users to combine audio from the R-26’s mics with streaming audio from the PC. The R-26 comes with Cakewalk’s SONAR X1 LE, a professional Windows-based DAW for general audio production in addition to mixing and processing R-26 recordings. With its rear-panel mount, the R-26 can be easily installed on any standard camera tripod stand, or on a mic stand with an optional adapter. An extensive line of accessories is available to complement the R-26, including the OP-R26CW Cover/Windscreen and the CS-10EM Binaural Microphones/Earphones to name a few. 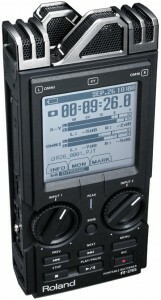 The R-26 Portable Recorder will be available in October with a street price of £349.